The other day, immediate ex-president TM Iwatsuki and I were taking the same train after the Steering Committee meeting. She noticed the bag I was carrying and said it was very cute. I myself fell in love with this bag when I saw it, not only because of the lovely pictures, but because it says ‘how to keep your husband’! For example, ‘no gossip over the phone’, ‘put you picture on his desk’, ‘if he is tired, bring him his favourite drink’, etc. Then TM Iwatsuki said, something quite symbolic of KeyForce, ‘You should make a version of “how to keep your wife” and make a speech about it!’ I said it is quite symbolic of KeyForce because the man & woman issue is one of the hottest topics of our club. Not that we are trying to batter men to prove the superiority of women, but that we are striving to achieve a sense of harmony between the sexes, that both women and men live a happy, fulfilling life and contribute to the society. Besides the issue of the sexes, we also actively discuss issues of ecology, health and the body, business ethics etc., which are the universal concern of all human beings. In the open atmosphere of KeyForce, we learn to acknowledge differences between each individual, not just between man & woman, and the importance of understanding. And why Toastmasters? Why public speaking? It is a place where we learn communication and leadership, and to share expand ideas. When we have a chance to express our thoughts, and have our opinions heard, we know that we can make better decisions in life. In a world full of choices, it is important to make the right ones. Like when you press a button on the drink vending machine, you want to make sure you are getting a bottle of water and not a bottle of poison! With the Toastmasters, we know that we can choose communication but not violence, humour but not anger, peace but not war. 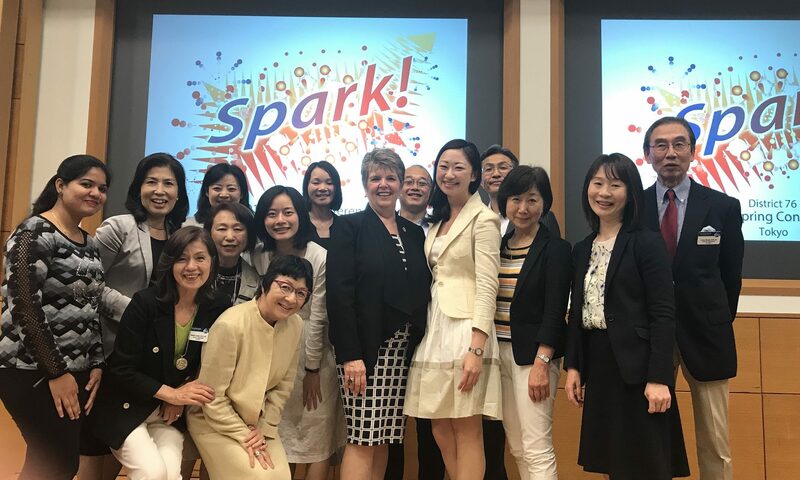 In year 1999, TM Ann Sado and a number of experienced toastmasters set up this fabulous club to encourage women’s leadership through English public speaking, and it was chartered in year 2000. Hence, KeyForce is celebrating its 5th birthday! With the wonderful officers I am working with this year, I am sure that it will be a fruitful year for all of us! If we gain 10 points on the Distinguished CLub Program, we can achieve the highest Distinguished Club Award- the President’s Distinguished Club Award! What a great way it will be to celebrate the 5th anniversary of KeyForce! Everyone, thank you for your support and let’s look forward to a superb year for KeyForce! Last but not least, let give a big hand to TM Iwatsuki and her ex-officers for their efforts last year that gave us so many precious moments of fun and laughter. They worked really hard and were always caring for members’ needs.